I won’t go so far as to claim that chicken soup is a miracle healer. I will say that a good soup can boost your immune system and improve your chances of beating a virus. 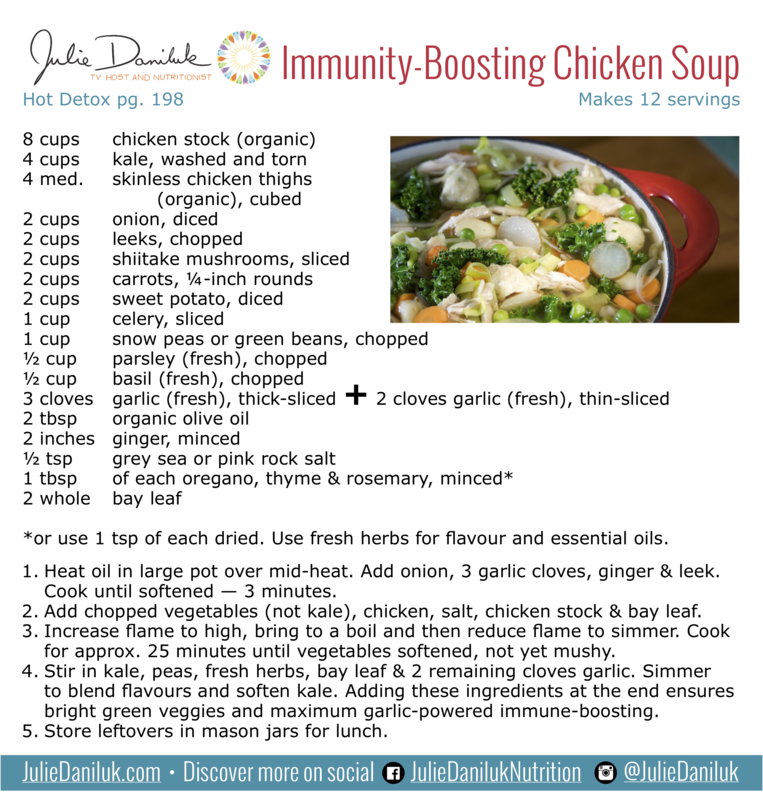 Chicken soup is a fantastic weapon when a cold or a flu bug is knocking you around. 9 healthy reasons to make this Chicken Soup! Using real chicken broth, made with the bones of a chicken, means it will contain B vitamins (in the marrow), calcium, magnesium and zinc all of which can assist your immune cells in fighting off colds and flu. Green vegetables such as kale, leek, peas and beans contain B vitamins that provide energy, as well as nerve and adrenal support. Keep in mind that stress reduces your immune function. Hot soup helps to thin out mucus. When you’re healthy, your nasal mucus is clear and thin, serving to filter air during inhalation. During times of infection, mucus can thicken into a moist, nutrient-rich environment that encourages growth of viruses and bacteria. A mug of this chicken soup can thin that mucus and help your body fight infection. This soup is hydrating and provides electrolyte minerals that your body uses to carry electrical signals from cell to cell. When you run a fever, you can get dehydrated, which decreases these critical minerals. It tastes so darn good because of all the fresh ingredients. That alone will cheer you up... and a smile has been shown to be the best immunity-booster of all! 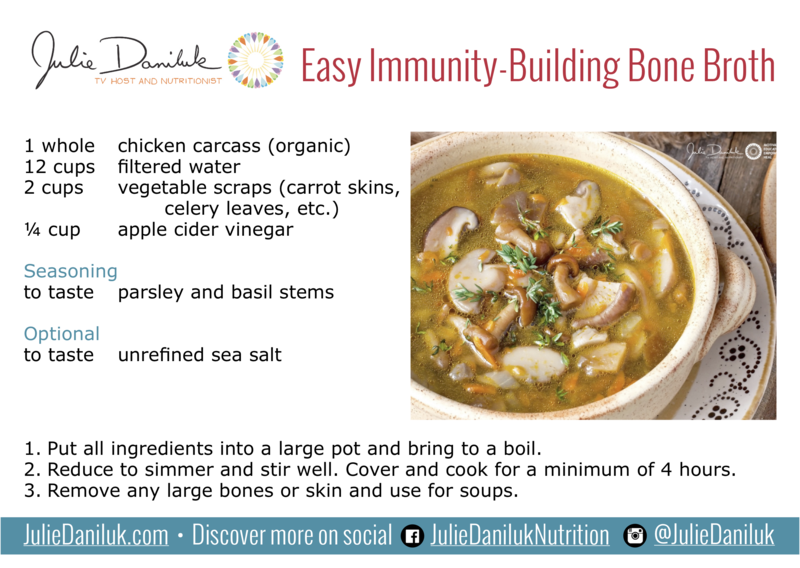 Make a calcium-rich bone broth in advance so your immunity-boosting soup can come together in a flash when you’re under the weather. You can store the broth for up to 3 months in the freezer. All the veggie scraps provide extra immunity-supporting minerals. The stock is essentially free because it’s made from stuff you were going to throw out! Note: Bone broth can be made from a variety of bones, such as organic beef, bison, turkey and lamb. They don't necessarily need to be roasted ahead. 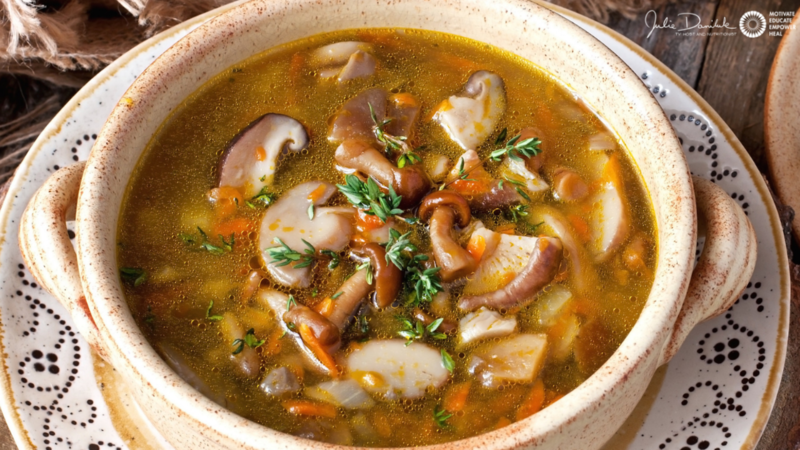 Bone broths are typically simmered for a long period of time (at least 4 hours), to release the nutrient-dense marrow from the centre of the bones, the high protein gelatine from the collagen-rich joints and the minerals from bones. At the end of cooking, the bones should crumble when pressed lightly between your thumb and forefinger. Voutilainen S., et al. “Carotenoids and cardiovascular health.” Am J Clin Nutr. 2006: 83(6): 1265-1271.